"Cut Vegetables Effortlessly and Clean - - Make Matchstick Carrots Better than a Mandolin - - Slices Cleaner than Any other Blade - - The Chef's Favorite Knife"
Most Efficient Chinese Style Chef Knife On Amazon! Premium Quality, Infinity Performance. This Is What You've Been Waiting For! ---> Simply Click "Add to Cart" to claim the Best Performance Chef Knife on Amazon...and reap the benefits of becoming a Home Master Chef...100% risk free! 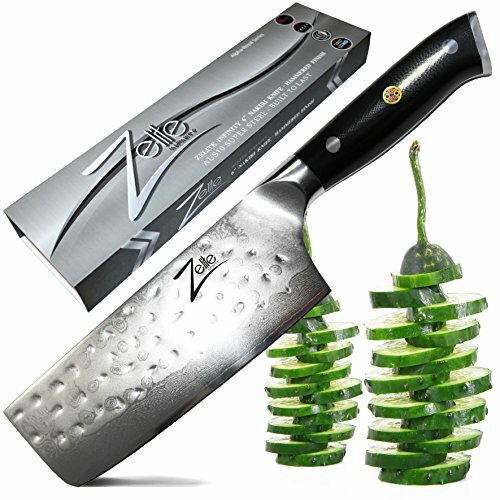 ✅ UNRIVALED PERFORMANCE, RUTHLESSLY SHARP >>> Hand Finished using the Traditional 3-Step Honbazuke Method this 6" 55mm Extra Deep Blade has an Incredible 12 degree pro razor edge per Side, Mirror Polished Cutting Angle Ensuring Maximum Sharpness & Safety, Effortless Slicing of Meat, Fish - Sushi, Vegetable, Fruit and more, bringing Excitement back to Cooking. Premier Razor Sharpness Ensures your Slicing and Dicing is done Clean & Effortlessly! Asian Style Blades - Butcher Veg so Good! ✅ 100% SATISFACTION or MONEY BACK GUARANTEE - TRY IT RISK FREE >>> Lifetime Warranty against Manufacturing Defects (only if purchased direct from 'Zelite Infinity' - check item is "sold by Zelite-Infinity"). Our Chef Knifes have been built with Perfection in Mind. Ideal Multipurpose Cutlery Gift (Christmas, Weddings, Birthdays, Fathers Day, Mothers Day), for Home Cooks, Professional Chef's, Culinary Students and more. You can't lose. Limited Supply, Order Now before they are Sold Out!